Google, LinkedIn, and Facebook Ads offer advanced targeting capabilities that allow you to deliver content to each individual audience segment with the right messaging to optimize engagement and click-through rate. These platforms provide advertisers with granular tracking and analytics so you can fine-tune the results. Not to mention, the AI-driven automated targeting features allow you to leverage their vast amount of user data to optimize your ROI. Remarketing ads on Google and Facebook has become increasingly popular among marketers and is highly effective in improving click-through-rates and conversion rates. Retargeting ads support your omnichannel content promotion strategy by increasing your reach on a variety of channels to build trust and stay top of mind. When used as part of your online advertising strategy, remarketing ads can deliver highly relevant messages to progress audiences that are already familiar with your brand to the next stages in their customer journey. Email marketing is a great way to promote your content, nurture your leads, and progress them down the sales funnel. To maximize the results, segment your list to deliver the right message to the right audience at the right time. Over 50% of marketing professionals say message personalization is the most important factor in creating a successful email marketing campaign. You can also design behavior-triggered workflows to send the appropriate follow-up messages based on a recipient’s interactions with your content. Use a link building strategy to distribute your content to a broader audience while driving traffic back to your website. These backlinks can also boost your site's SEO so it'll rank higher in relevant search results and get found by high-quality leads. For example, when you publish a guest post on an authority site, you can often include a couple of backlinks to the content on your website in the article and/or your bio to share relevant content and your information. 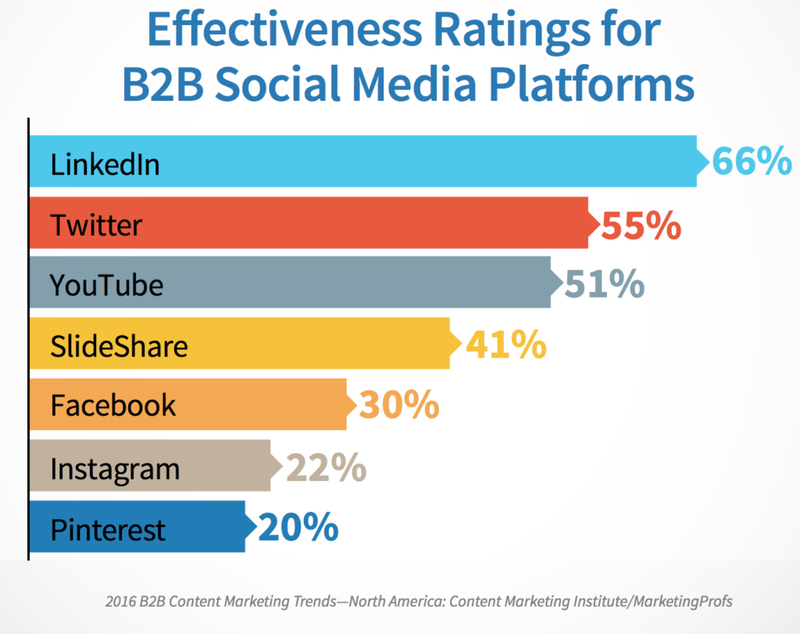 An increasing number of B2B buyers are using social media to connect with their colleagues, get industry updates, and research products or services. Sharing relevant and helpful content on social media allows you to join the conversation and build trust with your target audience. When distributing your content, use the appropriate hashtags to get your posts in front of those who are interested in the topic. In addition, ask your employees and partners to share the content with their networks. For many B2B marketers, LinkedIn is a powerful platform to promote their content, position their brands as subject matter experts, and drive high-quality traffic back to their websites. A prospect is more likely to read a piece of content if it’s recommended by someone they know and trust. In addition, people like to share information if doing so makes them appear resourceful and knowledgeable. Ask your partners and colleagues (e.g., by sending a text or a personal email) to share your content. Indicate the kind of audience that will benefit from the information and articulate why it’s relevant to their contacts. You can also ask industry influencers to share your content with their followers. Make sure the content is of high quality because they’re putting their reputations on the line for you. Also, include pre-written materials (e.g., social media posts) to make sharing as easy as possible. Marketing experts believe that the most successful companies spend only 20% of their time creating content and 80% of their time promoting it. Think about your personal approach and where you're seeing the highest return on your marketing efforts. The right promotion strategy can help you maximize the ROI of your content marketing budget by attracting high-quality leads, nurturing relationships, increasing conversions, and improving customer retention.